Although people in India find more security and comfort with nationalized or Government banks, private sector banks are also favored by those who look for good customer support and quality service. In my experience, State Bank of India is the only Government bank that could match the standards set by Private Banks in terms of customer support and services offered. Private Sector banks are also preferred as they offer a customer-centric and quality based products that not only serve great return on investments, but also add a good lot to the countries national income, hence improving the country’s economy. 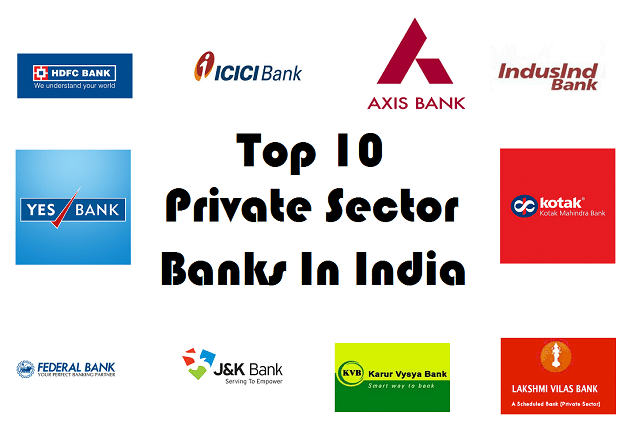 Today, we bring you a list of top 10 Private Sector banks in India based on the customer satisfaction and quality of banking products offered by these banks. HDFC Bank was established in the year 1994 by Mr. Hasmukhbhai Parekh, a Padma Bhushan holder, at the time when the Government gave a thumbs up to the private banks. Since then, HDFC (Housing Development Finance Corporation) Limited has been a trustworthy bank offering all the major banking products such as Insurance, Credit Cards, Loans, FOREX services, Premium Banking, Private Banking etc. Currently, the bank stands on top in India for market capitalization and is ranked 5th in terms of asset value. Also credited as the first private bank in India that got approval by RBI to establish a bank, HDFC currently serves the Indian public through a chain of 3200 branches and 12000+ ATMs all over the country. Established in 1994 at Vadodara, Gujarat, ICICI Bank is currently the 2nd largest bank in India in terms of assets and third in market capitalization. ICICI (Industrial Credit and Investment Corporation of India) Bank is widely popular for its customer support and premium services as well as offers all the major banking services such as Privilege Banking, Loans, NRI Banking, Insurance, Credit Cards, Private Banking, etc. With 3540 branches all over India in addition to 11200 ATMs in the country, ICICI Bank is undoubtedly the most widespread private bank in India.The parent company of ICICI Bank was formed in 1955 as a joint venture between the World Bank, India’s public sector banks and public sector insurance companies in order to generate finance for India’s flourishing industrial growth. In 1994, ICICI bank was established by Industrial Credit and Investment Corportation of India as a wholly owned subsidiary and the parent company was later merged with ICICI Bank. Formerly known as UTI (Unit Trust of India) Bank, Axis Bank serves as the third largest private sector bank in India. Similar to HDFC Bank and ICICI Bank, Axis Bank was also established in 1994 as UTI Bank after RBI gave the nod to private sector banks in India. Although a private sector bank, majority of Axis Bank promoters such as UTI, LIC and GIC, which collectively hold approximately 34% of its shares, is owned and managed by the Government of India. With their registered office at Ahmedabad, Gujarat, Axis Bank majorly offers financial services to the customer segments from Large and Mid-size Corporates, Agriculture and Retail Businesses and MSME. The bank also offers general banking services such as Consumer Banking, Corporate Banking, Loans and Insurance services, Investment Banking, Credit Cards, etc. Kotak Mahindra Group has been in the Indian finance industry since 1985 through Kotak Mahindra Finance Ltd. after being established by Uday Kotak. However, the banking operations were started in 2003 after Kotak Mahindra Bank was formed by the group after getting a license from RBI for Kotak Mahindra Finance Ltd. to commence its banking business. Kotak Mahindra Bank came into limelight when it started offering 6% interest rates on savings account instead of the common 4% by other banks and instantly attracted a good number of customers. In the year 2015, it also acquired another highly recognized private bank ING Vysa Bank, increasing its tally of total branches across India to 1261. Kotak Mahindra Bank is the most suitable bank for corporate and retail banking, as well as it offers a wide range of products through its multiple subsidiaries in the areas of personal finance, investment banking, wealth management and life insurance. Co-founded by Rana Kapoor in 2004, Yes Bank is currently India’s 5th largest Private Sector bank. Being the only Greenfield Bank license holder in the past two decades, Yes Bank has established itself as a Full Service Commercial Bank. The bank specializes in Corporate, Retail and SME Banking, Investment Banking, Corporate Finance, Branch Banking, Wealth Management etc. Spread across 630 branches and 2000 ATMs in India, Yes Bank is undoubtedly one of the top private banks in India and highly recommended for corporate banking and finance. IndusInd Bank is among the earliest new-generation private banks in India launched in 1994. Highly influenced by the Indus Valley Civilization, the founder of the bank, Mr. Srichand P. Hinduja decided to name the bank as IndusInd Bank. Started with a market capital of 1 billion, the bank today specializes in retail banking segments and is always one step ahead of its competitors in introducing new technologies in order to make banking easy for its customers. As of May 2015, the bank serves its customers through a chain of 745 branches, and 1635 ATMs spread across 392 geographical locations of the country. Set on a growth path, the bank is also aiming to double its branch chain to 1200 by March 2017. Formerly known as Travancore Federal Bank, when it was established in the year 1947 under the leadership of Mr. K P Hormis, Federal Bank is 7th on our list of top 10 private sector banks in India. The bank offers all major banking services as well as specializes in Corporate Banking, Lonas, Insurance and NRI Banking. Since its establishment, Federal Bank and its employees are working hard in order to offer the best client support to its customers. Spread across 1251 branches and 1526 ATMs in the country, the bank is progressing to maintain its position among the best private sector banks in India. Jammu and Kashmir Bank was founded in 1938 by the Maharaja of Jammu and Kashmir, Hari Singh. When the bank started its operations in 1939, it became one of its kind state owned bank in the country. Although the bank prospered in its initial years, it faced some serious problems during independence when 2 out of 10 branches went under the Pakistan-administered Kashmir along with the cash and other assets. Currently, the bank is spread across 821 computerized bank branches and 1000 ATMs across the country. Karur Vysya Bank is founded by M.A. Venkatarama Chettiar and Athi Krishna Chettiar in 1916 with its headquarters set up in Karur, Tamil Nadu. Karur Vysya Bank is also one of the most reputed commercial banks in India that is highly recommended for its excellent customer service. Karur Vysya Bank is among our list of top 10 private banks in India as it is spread across 18 states in India with 657 branches and a network of 1652 ATMs. Lakshmi Vilas Bank was an initiative launched by a group of seven progressive businessmen from the Karur town of Tamil Nadu, under the leadership of Shri V.S.N. Ramalinga Chettiar. The main goal of setting up Lakshmi Vilas Bank was to help the traders, farmers and industrialists in and around Karur financially in order to help the economy and livelihood of the people of Karur. Today, the bank has established its network of branches beyond Tamil Nadu in the neighboring states of Andhra Pradesh, Karnataka, Kerala and many other financial hubs such as Mumbai, New Delhi, Kolkata along with many significant business markets in Maharashtra, Gujarat and Madhya Pradesh. Today, Lakshmi Vilas Bank serves its customers through its network of 446 branches and 832 ATMs across India.